An easy and super creamy no-bake cheesecake, spiked with Bailey’s, topped with a coffee and Bailey’s Whipped Topping, in an Oreo cookie crust! This is one of our favorite desserts yet. It snuck up on us though. I knew we’d like it, but I didn’t expect how much we’d like it. More accurately, looove it. It was a sleeper favorite. Obviously, we like all of the flavors in this: Bailey’s, chocolate, coffee, and stuff with creamy texture. What’s not to like? Those are all wonderful. And while I like all of those things a lot, I can’t isolate any single one of them to say that adore it. Except coffee. 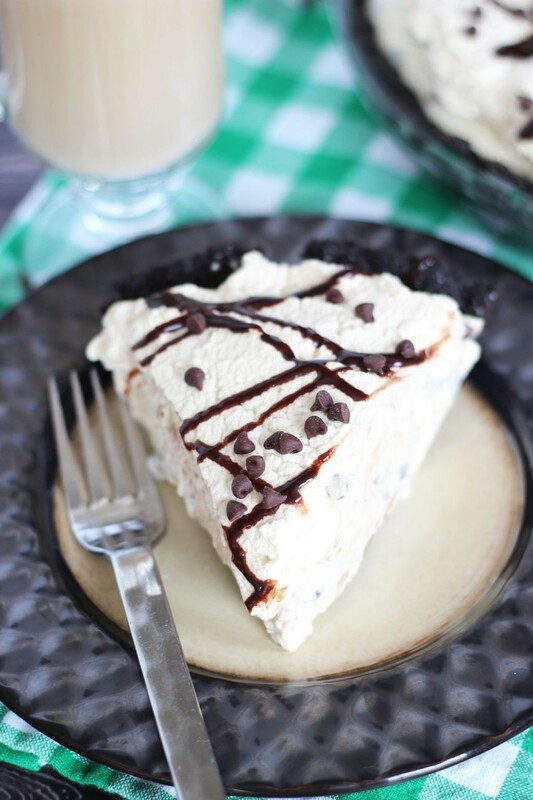 I do adore that stuff in any way, shape, or form, but I still don’t see a coffee dessert and anticipate that it will turn out to be an all-time favorite. Therefore, I didn’t expect this cheesecake to be an all-time favorite. But it is. All of the flavors together are perfection. Especially combined with a creamy, silky, light, and luscious texture. It’s rich, but not heavy. It has the perfect amount of Bailey’s and the perfect amount of coffee. It won’t get you drunk, and it won’t give you a caffeine rush, but you *will* taste both, and they both make their presence known without being overwhelming. I also stuffed it with some mini semi-sweet chocolate chips. It had to have them. Those little mini ones make every single dessert better. 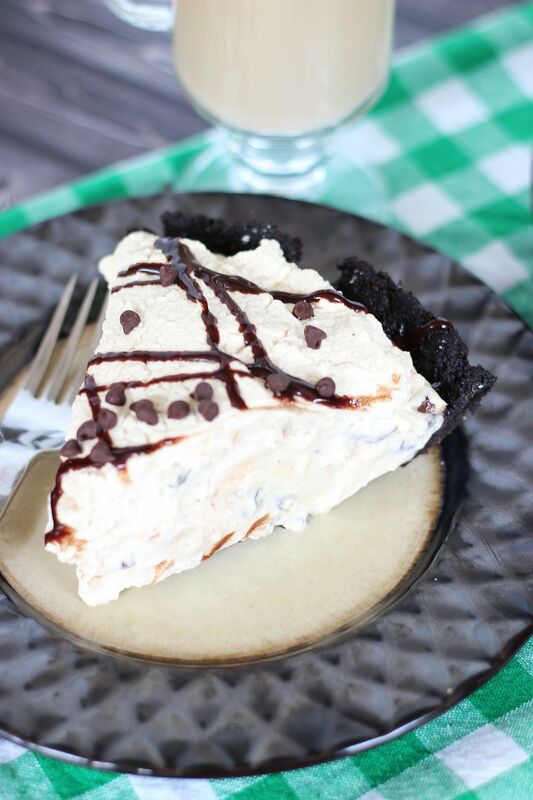 They add a little crunch to the creamy silkiness, and the burst of chocolate adds more richness and intensifies the Bailey’s and coffee flavors. Unfortunately, it didn’t photograph nearly as beautifully as it tastes. Tan and brownish foods are still troublesome for me in photos, and I haven’t quite figured out the right formula for making those things pop in pictures. I welcome any helpful hints please! Because this is a very monochromatic food, and light in color, it didn’t really lend itself to stunning photography! Pretty sure I’m not capable of stunning photography even in the most ideal conditions, but even harder when the food is light tan!! The photos don’t do justice to the deliciousness of this cheesecake. Let’s leave it at that. Since it’s no-bake, you could truly put this cheesecake together in about 20 minutes. You have some idle time waiting for the cream cheese to get to room temp, but once you’re there, this thing comes together in about 20 minutes. 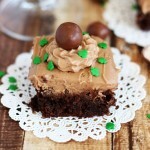 I can’t think of an easier and tastier St. Patrick’s Day dessert! 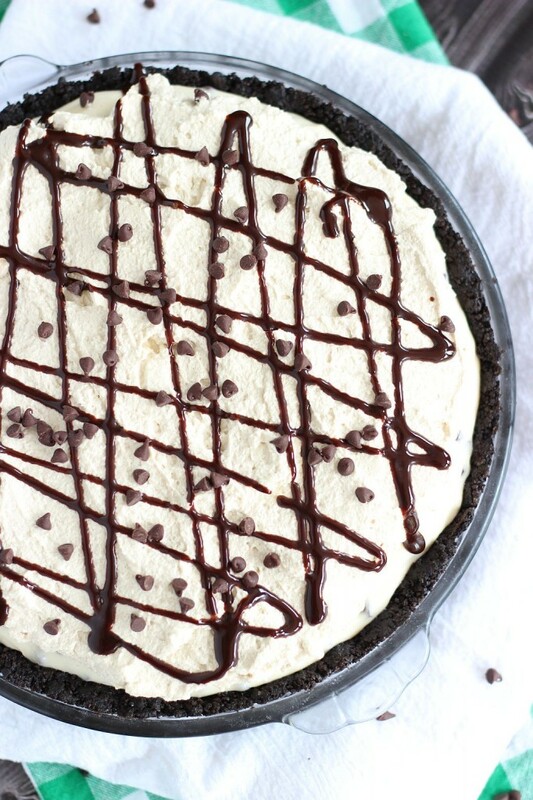 An easy and super creamy no-bake cheesecake, spiked with Bailey's, topped with a coffee and Bailey's Whipped Topping, in an Oreo cookie crust! 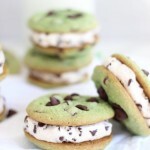 30 chocolate sandwich cookies like Oreos! In a food processor, pulse chocolate sandwich cookies until crumbly. Add the sugar and melted butter, and mix until incorporated. Gradually add the sweetened condensed milk in 4-5 additions, mixing well after each addition. Beat in the Bailey's Irish Cream. Pour into the pie crust and smooth the top with a rubber spatula. In a mug, combine instant coffee granules and hot water. Stir until granules dissolve. Set aside. In a large mixing bowl, combine heavy cream and sugar. Beat until stiff peaks form, about 6-7 minutes. Beat in the coffee and Bailey's. Spread over the cheesecake layer. 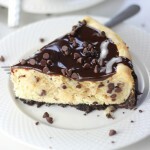 For topping, if desired, drizzle with chocolate syrup and mini semi-sweet chocolate chips. Refrigerate until firm, at least 1 hour. Serve! 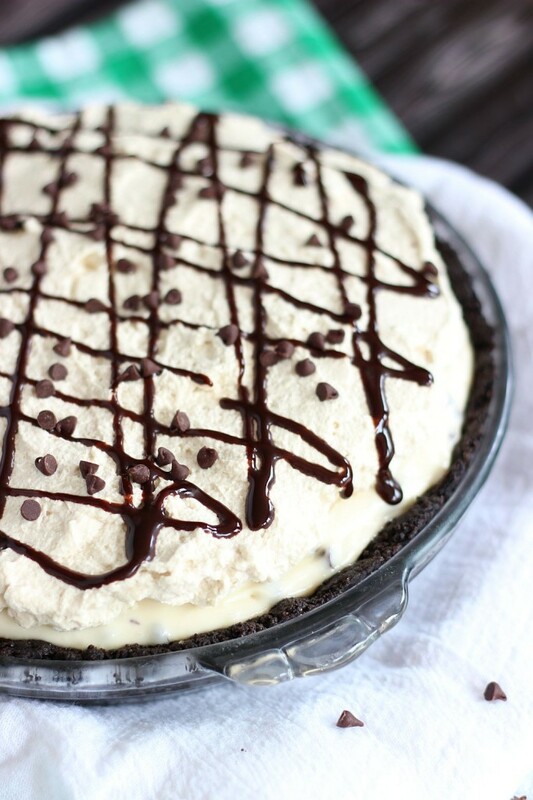 You should drink a Bailey’s-spiked coffee with this dessert, of course. Because that’s not flavor overkill! Maybe a Guinness instead. Beer and cheesecake… mmmmmm. I’ll take all the cheesecake! It looks amazing! Wow, I love how easy this is! Looks delicious Sarah. I have been eating way too many desserts these days but still your pictures are making me crave some more..haha! Pinned! Me too. Seriously… way too many desserts!!! Haha! Thanks, Manali! I love a good cheesecake, even if I can’t get all hyped up from the booze or the coffee. Lol. So perfect for St. Patrick’s Day! Right? Light foods and pastels are really hard. I can’t figure out how to make the colors pop. Such a pain. Thank you for saying they look fine though!!! They don’t do justice to how much prettier it is in person! Haha! Woah! This looks super fluffy Sarah!! Sarah, this cheesecake is just calling my name! It looks SO good! I’m such a huge fan of no-bake cheesecakes and this one looks like the ultimate treat. I really wish I had a piece of this for breakfast right now! Thanks so much, Gayle! 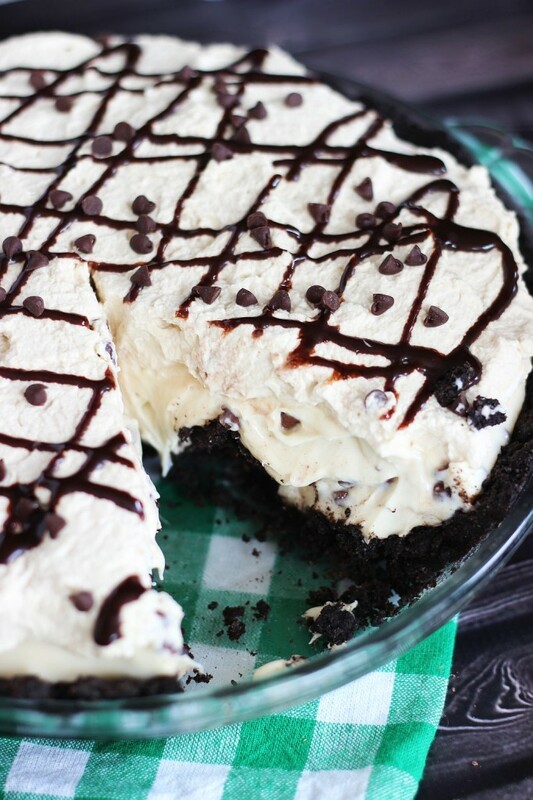 I love no-bake cheesecakes too. So simple and easy! 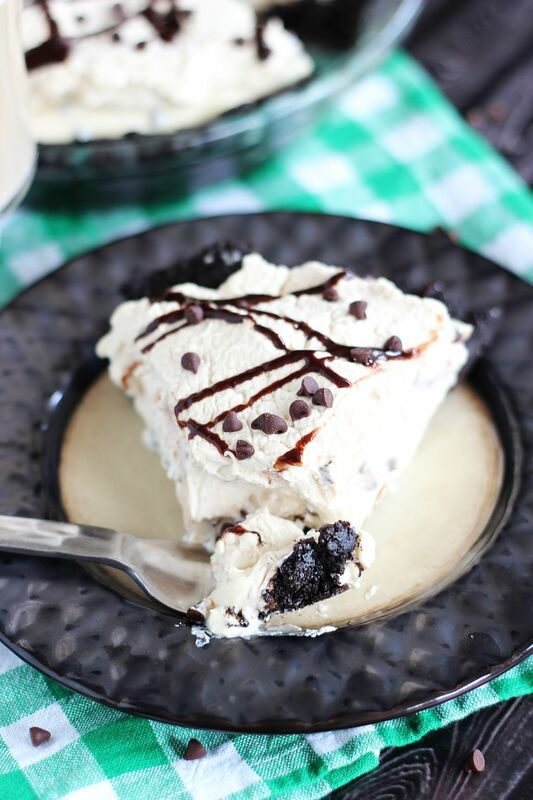 coffee, baileys, cheesecake, and chocolate – I’m all in! Um YUM! I love the mini chips too and I need this cheesecake on a plate in front of my like YESTERDAY! Hahaha!!! Bailey’s cheesecakes are amazing, right?? Your mini ones look fabulous too!! Love no-bake cheesecakes and the bailey’s sounds incredible in here! It looks so fluffy and amazing! Agreed.. no-bake cheesecakes are so simple, and so delicious. Creamy and light and wonderful! Thanks so much! Yum!! We love baileys! I’ll have to try this soon. Definitely! We love Bailey’s too, and this cheesecake was delish! Oh my goodness, this looks amazing! Thank you for sharing! Have a wonderful week and please come share and link up with me now!! I must have missed my piece when you stopped by to link and share, lol It looks out of this world delicious!!! I give it a 5 star! Thanks for visiting to link and share on the Oh My Heartsie Girl ww this week!!! Oh this sounds soooo good! Thanks for sharing it on the Thursday Blog Hop. It is a keeper. Sarah this looks so amazing! 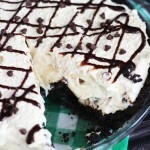 I’m already inspired to make No-Bake Bailey’s Irish Cream Cheesecake with Coffee Whipped Topping for my hubby. He will LOVE it! Thanks for linking up at the #pureBlogLove Link Party. Thank you so much, Diane! I’m so glad you like it. It was one of our favorite desserts ever! Do you make this and where is the sugar in the ingredients? You are to mix powdered sugar and irish cream at the end. But again, what about the sugar you are to mix with the cream cheese, milk and vanilla? The sweetened condensed is ultra-sweet and so it doesn’t need added sugar! Thanks so much, Erica! Hope you had a great weekend! This looks fantastic! Pinned. Thanks so much for sharing at the Create & Share Link Party. Hope to see you again tomorrow night (7:00 PM MST)! 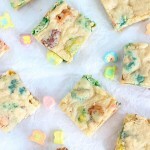 So many great Easter desserts to choose from right here but I think this one wins. Although, I just might HAVE to do something else too! Thanks Sarah! GREAT website! Big piece for me, please! Thanks for linking up with Best of the Weekend! Sarah: Can you provide nutritional information for this yummy-looking recipe? I am paying attention to my caloric intake and food portion sizes as I joined Weight Watchers at the end of last summer to lose some extra pounds. 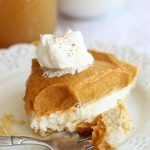 I have done very well and am nearing my goal, but I am wondering to what extent this recipe might work with low-fat cream cheese or Neufchatel (I probably spelled that wrong) cheese, and possibly light whipped cream instead of heavy cream, or even fat-free Cool Whip for the topping. I’m not a Philistine or anything but if I can make a lower-fat version of this that will taste halfway decent, I will give it a try. Hi Margo: Unfortunately, I cannot provide the nutritional information, but there are many sites that calculate that for you! You can *definitely* lighten this up by using reduced-fat cream cheese, and a fat free or lite whipped topping! 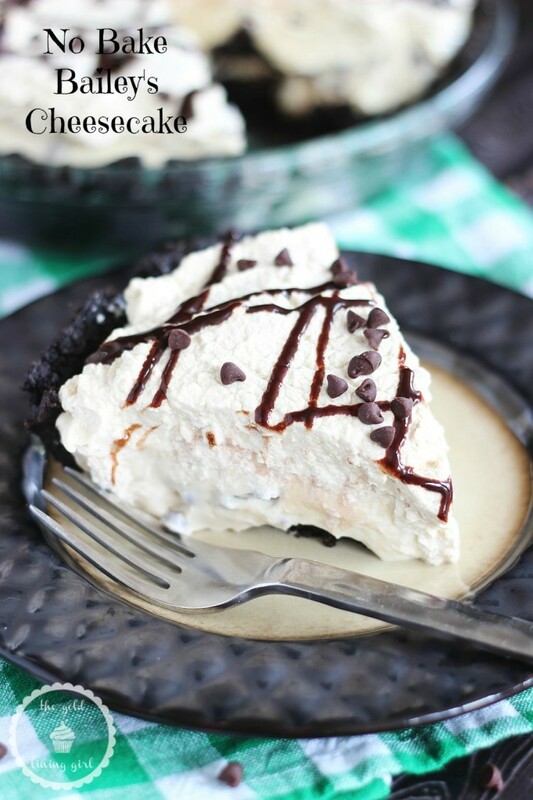 You could even reduce the amount of chocolate chips that you add in, and for the crust, you could probably find reduced-fat Oreos! I believe they make reduced fat Oreos! There’s a lot of ways you could cut calories here actually. I hope that helps!! With my love for coffee and having a sweet tooth, I definitely need to try this sometime!